These zesty cheese pizzas topped with a refreshing green salad make an easy weeknight supper. I use prewashed greens from the grocery store this time of year, especially baby spinach leaves and arugula. Pre-shredded cheese and boboli pizza crusts cut corners, but not flavor for this fast family meal. Get the kids to help put it together. They may even eat their veggies! My Feb 23 supper: I added a few cannellini beans to the cheese topping before the pizzas went in the oven. I loved the flavor and texture they added. (Canned garbanzos, kidneys or pintos would also be good.) 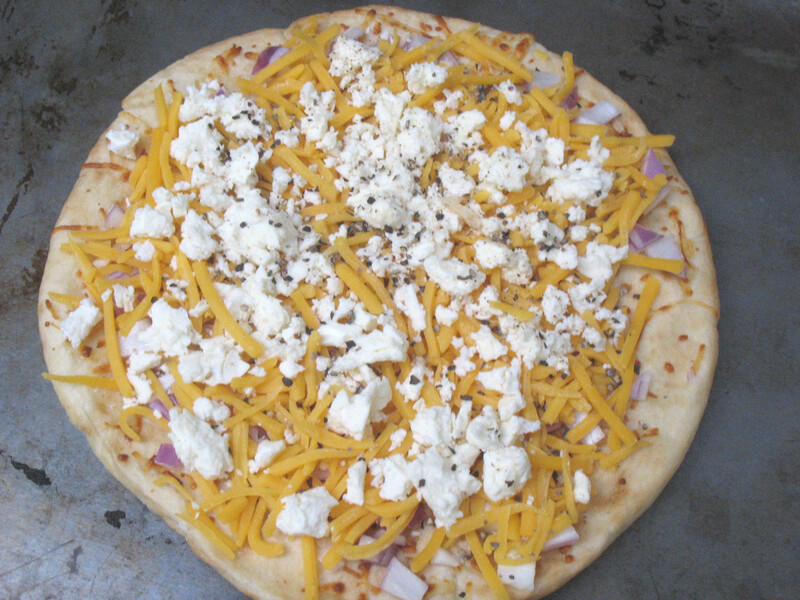 Then I started thinking about the other topping possibilities such as capers and chopped kalamata olives et al! You can also use your favorite bottled Italian dressing for the greens. Preheat oven to 425°F or heat grill to medium. Whisk together olive oil with remaining dressing ingredients. Place greens, and tomatoes if using, in a large bowl. Set greens and dressing aside. Arrange precooked crusts on sheet trays. Sprinkle each crust with 2 tablespoons red onion, 1/2 cup Cheddar cheese, 1/4 cup feta cheese, and black pepper to taste. Bake 8 minutes or until cheese is melted. Or place each pizza directly on the grill. Cook with cover closed 4-6 minutes, or until cheese is melted. Drizzle about 1/3 the dressing over salad. Toss and taste; add more dressing if desired. Remove pizzas from oven and place on individual plates. 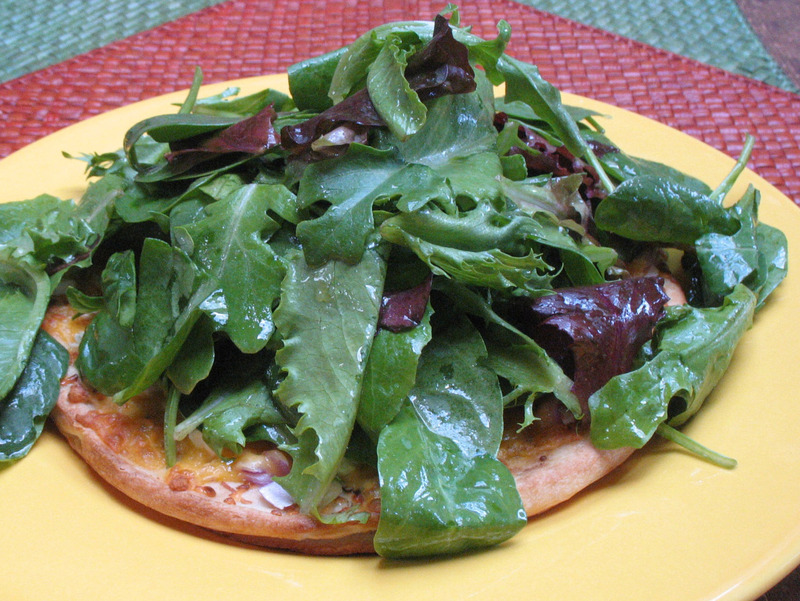 Top pizzas with salad, piled high — about 2 cups per pizza. Serve immediately, with knife and fork. Use remaining dressing for other salads. Love the idea! Fold in half and eat like a gyro? Gyro-like sounds fun. Yet, it may be too hot to pick up and perhaps too crisp to fold. And for me, the salad falls all over the place because I really pile it on. I tried picking up a wedge last night — big mess. At least I had a napkin on my lap! Rita Held & Rosemary Mark, seasoned food professionals, help you cook simply with appealing, achievable, accurate recipes. Join our kitchen conversation by posting a comment below our recipes about how you ‘Get Cooking Simply’.